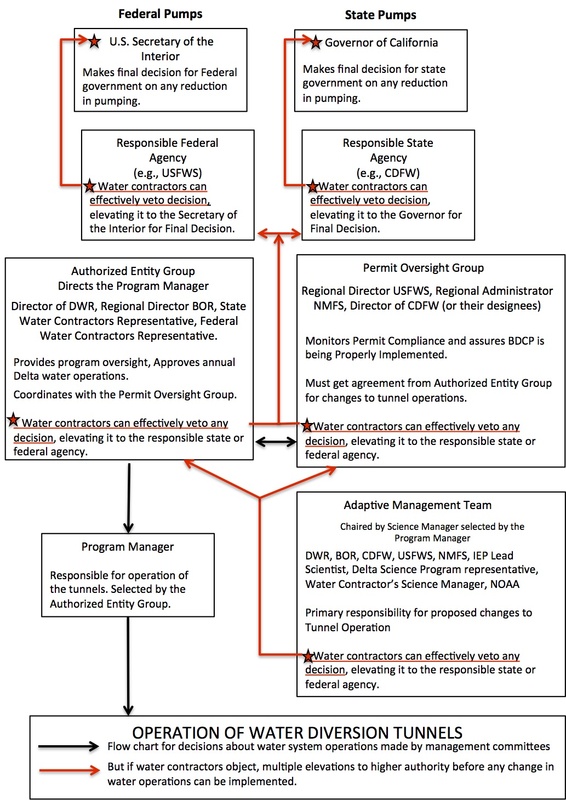 The BDCP claims that they won’t harm Delta waterways because of a new adaptive management approach to water operations. Several management teams will oversee tunnel operations. The California Department of Fish and Wildlife (CDFW) and the U.S. Fish and Wildlife Service (USFWS) will also have seats on the management committees. An Adaptive Management Team will monitor conditions in the Delta and make recommendations for changes in water operations based on any ill effects that might crop up. No – because no matter what harm the tunnels might cause, it will be virtually impossible to curtail water exports once the tunnels start operation. Because the main backers of the tunnels, the water contractors who will receive water deliveries from the tunnel and sell the water to their urban and agricultural customers, have seats on key committees and can veto decisions they don’t like escalating the decision all the way to either the Governor of California (for the State pump decisions) or the U.S. Secretary of the Interior who reports directly to the President (for Federal pump decisions). For more information, see the April 3, 2012 STCDA Press Release. Adaptive management can work in particular cases such as those which involve long-term monitoring or cases which more directly involve the community. In the case of the Delta, I would be more supportive of an adaptive management scheme which allowed for direct policies to be implemented in the case of clear, specific, and identifiable injuries to humans, wildlife, or general ecosystem services. While an adaptive management system may have a relatively slow legislative process, it could be argued that getting a lot of relevant political actors to sit down and discuss reforms could be worth the cost. Let me make a quick disclaimer, I am not in favor of the BDCP, I think it could be improved. I do however, like that the policymakers are leaning towards an adaptive management system. Isn’t having the main (any) backers on the committees a Conflict of Interest? This seems like a costly project to undertake when we already have a huge deficit! And selfish of the Water Contractors (monopoly)! Destroy our livelihood and environment for the profit of others. This is not only stupid but should be illegal! Who ca stop this? The governor has to have more sense than this and surely he can’t be bought. If the BDCP is all about saving the delta and the smelt, why are they not upgrading/fixing the current Tracy Fish Screen and the intake at the Clifton Court Forebay? at the last meeting they said that they will still operate both. After 40+ years of sucking millions of fish, why wouldn’t they correct this problem if they are so worried about protecting he smelt? Exactly! There isn’t a scientifically plausible answer. Thinking from the contractor’s standpoint, as long as they have the problem and threat of court order shutting the pumps down they have a “reason” to say they are building the tunnels to “save the fish”. If fish screens worked, then they’d be stuck just exporting the amount of water they now export. They can’t take a lot more without bringing in salt water into their pumps. I am not sure about adaptive management vs not. This is a political battle anyway. Identifying key supporters of our cause is always going to be important. Also you mentioned water contractors buying for urban and agriculture. I have heard but do not have facts that Bakersfield area is FRAKing (sp)(mining oil). And that these water contractor are gonna be selling water for 300 % more to INDUSTRY. That’s a big political machine. I don’t have time to check this out right now, but I have heard this tale from several people.